Make you own Artificial rock water features, garden ponds & water falls. 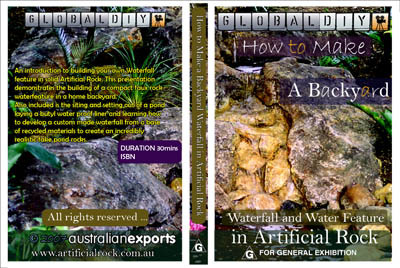 Make your own artificial rock water features, Waterfalls or Ponds using Fake or Faux Rock. Artificial rock water features are a beautiful addition to any garden. Now you can create the design you have always wanted. Save hundreds of dollars by constructing your own artificial rock water features, waterfalls, ponds and more. Create your own backyard waterfall resort style paradise with our DVD step by step guide to artificial rock water features! Waterfalls demonstrates the building of a compact Waterfall in a home backyard. The construction method uses recycled rubble and rock spill found onsite and the *Solid Rock making Techniques.